Explanation: No, this castle was not built with the Moon attached. To create the spectacular juxtaposition, careful planning and a bit of good weather was needed. 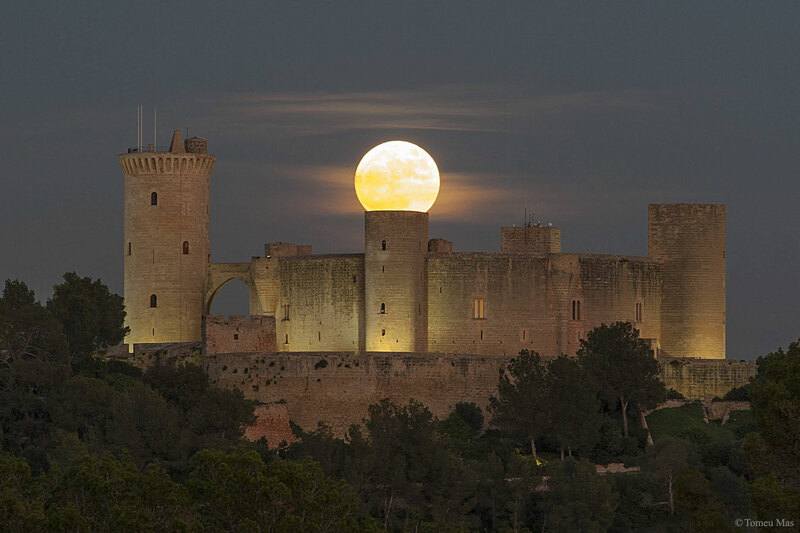 Pictured, the last supermoon of 2016 was captured last week rising directly beyond one of the towers of Bellver Castle in Palma de Mallorca on the Balearic Islands of Spain. The supermoon was the last full moon of 2016 and known to some as the Oak Moon. Bellver Castle was built in the early 1300s and has served as a home -- but occasional as a prison -- to numerous kings and queens. The Moon was built about 4.5 billion years ago, possibly resulting from a great collision with a Mars-sized celestial body and Earth. The next supermoon, defined as when the moon appears slightly larger and brighter than usual, will occur on 2017 December 3 and be visible not only behind castles but all over the Earth.